Sea ice forms from freezing of seawater. Dissolved salts— predominately NaCl, but many other ions as well—depress the freezing point of seawater by approximately 0.054°C ppt-1. For mean ocean water with a salinity of 34.5 ppt, sea ice forms at -1.86°C. Polar waters are often fresher than average seawater, due in part to limited evaporation. For salinities of 25 ppt and 30 ppt, water freezes at -1.35°c and -1.62°c, respectively. 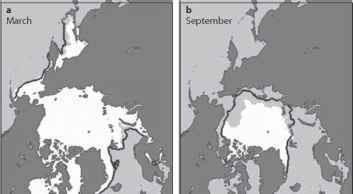 First-year sea ice forms in the autumn in the polar regions. New ice has many colorful terms to distinguish it, including nilas, grease, slush, and pancake ice. Figure 5.1 illustrates a spectrum of sea-ice types in the Arctic, including fresh pancake ice in the Bering Sea, late-summer ice floes in the Canadian high Arctic, and a fully developed winter ice cover in the Beaufort Sea (landfast ice on Alaska's North Slope). Sea ice is made up of a mixture of brine, ice crystals, air, and solid salts. Once nucleated, sea ice provides a platform for the deposition and accumulation of meteoric snow. Brine pockets trapped in first-year sea ice give it salinity values that are commonly in the range 5-15 ppt. During the summer melt season, sea ice reaches the melting point (0°C) and becomes permeable, with water and brine transport along intergranular veins. Brine rejection through this process freshens sea ice. For this reason, multiyear ice, which has survived the summer melt season, has only traces of salinity. Sea ice thickens through the fall and winter, growing from below through basal accretion, or aggradation. Thermodynamic growth of first-year ice is self-limiting to a thickness of about 2 m, or less than this when sea ice is mantled in a thick snow cover. At thicknesses beyond this, the ocean is effectively insulated from cold atmospheric temperatures, and ocean heat flux into the base of the sea ice is balanced by upward heat conduction through the ice and snow. 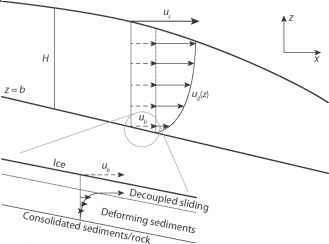 Thicker ice develops through mechanical ridging under convergence, compression, and overriding (rafting) of ice floes. Pressure ridges can reach thicknesses of 10-20 m.
Through the spring and summer in both the Arctic and Antarctic, a large fraction of first-year ice melts away or is advected to lower latitudes. 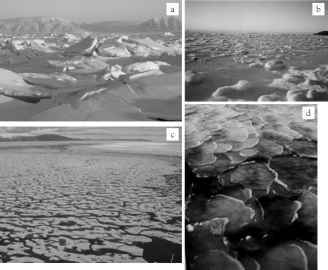 That which survives the summer becomes multiyear ice, which goes through further growth stages (thermodynamically and through ridging), commonly reaching ice thicknesses of a few meters. Figure 5.2 plots measured and modeled estimates of the winter thickness distribution of Arctic and Antarctic sea ice. The thick multiyear sea ice evident in figure 5.2a is a result of ice convergence against the Canadian Arctic Archipelago and northern Greenland, which gives thicknesses of about 5 m. These data represent a snapshot from February to March 2005 and are derived from satellite altimetry in the Arctic basin. 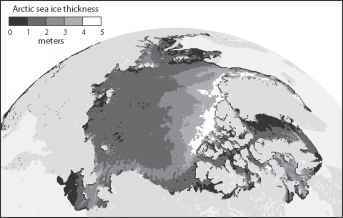 Ice thicknesses vary from year to year, but this general geographic pattern is persistent. In Antarctica, a more radially symmetric ice thickness pattern is evident, associated with ice divergence away from the coast. Thicker ice along the coast indicates multiyear ice in regions of ice convergence, particularly evident in the western Weddell Sea where ice piles against the Antarctic Peninsula. than half of the ice pack typically melts away in the summer, and more than 85% of the Southern Hemisphere sea ice melts each summer (see table 1.1). Although climate warming is being felt in the Arctic (chapter 9), this seasonal cycle is remarkably consistent from year to year. Figure 5.3 plots Arctic and Antarctic sea-ice extent for the period 1990-2000, based on microwave remote-sensing measurements of monthly mean ice extent. Sea-ice extent refers to the total area with at least 15% sea-ice cover; ice extent is therefore greater than the ice area. This figure testifies to the overall dominance of seasonal insolation cycles in governing sea-ice cover; other aspects of the climate system, such as variability in wind, pressure, and ocean conditions, influence year-to-year ice anomalies but these are difficult to discern in figure 5.3. The geometry of the Arctic basin also plays a hand in the consistent maximum winter ice extent in the north; winters are cold enough that most of the Arctic basin freezes over each year, with ice extent limited and defined by the continents. Antarctic sea ice is not continen-tally constrained, but its annual maximum is also very consistent, governed by the "ablation wall" imposed by the relatively warm waters of the Antarctic circumpolar current. These plots indicate total ice cover in each hemisphere; regional ice cover is much more variable. 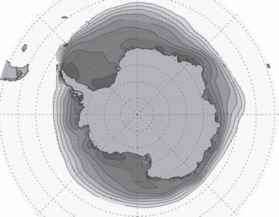 indicate the median monthly ice extent for the period 1979-2000.
and subject to Coriolis deflection. Pack ice, also called drift ice, consists of a mixture of ice floes and open water, with the latter taking the form of polynyas (open areas) or leads (cracks between ice floes). Open-water areas are sources of heat and moisture flux to the atmosphere. Many polynyas are persistent features from year to year, as open water is maintained by sea-ice divergence (due to prevailing winds or currents) or upwelling of warm ocean waters. It must not be supposed that this drifting ice of the Arctic seas forms a single continuous field. It consists of aggregations of larger and smaller floes, which may reach thicknesses of thirty or forty feet or even more. How these floes are formed and where they come from is not yet known with certainty, but it must be somewhere in the open sea far away in the north, or over against the Siberian coast, where no one has hitherto forced his way. Borne on the polar current, the ice is carried southwards along the east coast of Greenland. Thick, multiyear ice is prevalent where winds pile up ice in parts of the basin, such as the northern coasts of the Canadian Arctic Archipelago (figure 5.2a). The thick ice floes that Nansen observed drifting southward would have been multiyear ice from the archipelago or the Beaufort Sea gyre that was caught up in the transpolar drift and exported through Fram Strait. The geography is much simpler in Antarctica. Offshore winds from the continent push ice northward, giving a divergent ice pack with little multiyear ice. This offshore export is very effective in melting first-year ice, giving the strong summer minimum in the Southern Ocean that is seen in figure 5.3b. These processes also give systematic differences in ice concentration in each polar region; the average annual ice concentration in the Northern Hemisphere is 83%, versus 72% in the Southern Hemisphere. In the Northern Hemisphere, the average (1979-2010) ice area varied from 4.8 X 106 km2 in September to 13.6 X 106 km2 in March. Ice extents for the same period ranged from 6.6 X 106 to 15.5 X 106 km2. In the Southern Hemisphere, ice area and extent for the period 1979-2010 ranged from 1.9 X 106 to 14.5 X 106 km2 and 3.0 X 106 to 18.8 X 106 km2, respectively, with a minimum in February and maximum in September. It is difficult to estimate hemispheric-scale ice area and extent prior to satellite observations. Whereas seasonal insolation cycles and land-sea geography shape the sea-ice extent in each hemisphere, in-terannual and decadal variability in sea-ice thickness and concentration are influenced by air temperature, ocean heat fluxes, ocean circulation, and atmospheric pressure patterns, which drive surface winds. As discussed earlier, prevailing winds can concentrate ice along coastlines, supporting thick, multiyear ice, or they can drive ice divergence and export. Because these meteorological controls are immediate, sea ice adjusts rapidly to climate variability and change. An anomalously warm summer can lead to loss of sea ice, with numerous positive feedbacks that include decreased local and regional-s cale albedo, solar radiative heating of open water, increased sensible and longwave heat transfer from open water to the atmospheric boundary layer, and effects of open water on cloud cover. In the Arctic, these positive feedbacks contribute to multiyear "memory" and decadal-scale variability in ice volume. There is less multiyear ice in the Southern Hemisphere, so sea-i ce volume in the Southern Ocean has less memory; thermodynamic processes here produce interannual variability but limited decadal variability. Exceptionally detailed views of ice area, extent, and motion are available for the modern, satellite era (e.g., figures 5.2-5.4), whereas other aspects of sea ice are difficult to quantify. In particular, basin-scale measurements of ice thickness are elusive. Many local observations are available, and upward-directed sonar from submarine surveys provides good transect data, but sea ice is constantly shifting. Repeat sonar surveys along a particular transect provide information about ice-thickness changes over time, but they do not tell the complete story. Interannual variability in drift or convergence of the pack ice can give large differences in thickness in a region even though there may be little or no change in total basin ice volume.